Asthma is a common breathing disorder. The symptoms may come and go but the problem is always there. Asthma cannot be cured but it can be controlled and people with asthma can live normal lives. The air passages to the lung are inflamed. Inflamed airways are sensitive. The bronchial tubes react to many things, such as allergens (pollen, dust mites, animals), infections, smoke, exercise and weather changes. The airways can become narrow at times and make it hard to breathe. Not all people with asthma wheeze. For some, cough is the main symptom and often occurs following exercise or at night. Many young children wheeze but do not appear to be short of breath or in distress. Others with asthma become very tight and have to work hard to breathe. It’s important to know that treatment can reverse asthma symptoms and help prevent them from coming back. Treating the inflammation, of even mild asthma, can prevent it from worsening over time. It is also important to know that other disorders can cause some of these same symptoms. Not everyone who has breathing problems has asthma. The diagnosis is often established from the history of symptoms and the response to treatment. In older children and adults, breathing tests can help support the diagnosis, but there is no definitive “asthma test”. Other causes of wheezing, cough and/or breathlessness must be considered and ruled out by the physician. What happens during a flare-up of asthma? All of these things tend to make the airways narrower, partially blocking the flow of air, and often make it harder to breathe. Because different things are happening in the bronchial tubes of asthmatics, it often takes more than one kind of medication to treat the condition. Some of these medicines reduce inflammation and others relax tight bronchial muscles. It is important to know these differences. Asthma is a breathing disorder and not an emotional condition that is “all in your head”. Genetic inheritance is important and the disorder often runs in families. Allergy, viral infections, and air pollution (both indoor and outdoor) are important causes. Once a person has asthma there are many things that can trigger symptoms. Emotional stress, anger and frustration. 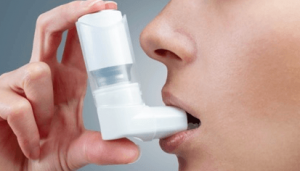 How can asthma episodes be prevented? How are asthma symptoms treated?